What a beautiful day it was today, although the sharp snap of the freezing temperatures reminds me immediately that it’s still deep Winter. Weather like today does confuse me a bit when I reflect on Global Warming and the difference between Climate and Weather. 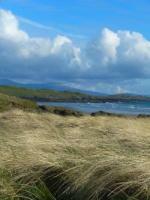 The last two years have presented us here on Anglesey with the kind of weather we experienced when I was a child. It feels like a reinstatement of proper annual weather. There again, I suppose I have to pay attention to the indifferent Summers here in the United Kingdom: Wet and Warm. 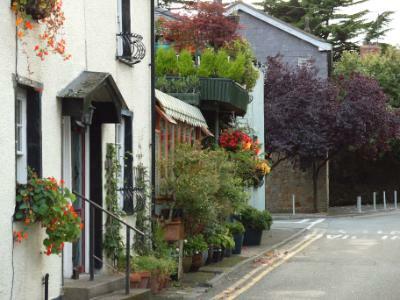 Anyway, after a pleasant drive along the road to Beaumaris, which is for me the Anglesey Riviera, the town stood proud as ever resplendent in its rich character in the glow of late afternoon Winter sunshine. The sky was icy, powder blue with a pink hue to the clouds low on the horizon beyond Llandudno and to the north and Point Linus and Amlwch. A year ago I’d remembered to bring my camera with me and snapped a fabulous scene of Serene Menai Straits Blueness from the heavens to the sea and the snow lying thin on the Snowdonia peaks across the Menai Straits. The bad news was that I’d forgotten to bring my camera with me today and was rather furious with myself. 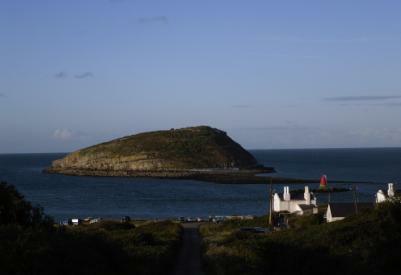 Especially so when I arrived at Penmon Priory and drove on to Trwyn Du, Penmon Lighthouse to spend some time looking across to Puffin Island – Ynys Seiriol. 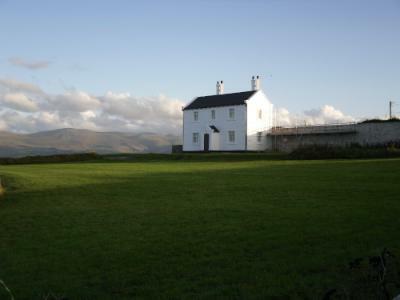 What I love about Anglesey is the ever-changing light. The sea and reflected light dominates the mood of the Island - from the dull flat to the imminent stormy and the clean sharp. It was about 4 O’Clock when I arrived at Penmon Priory and the sharp cold blue was veering to pink at the horizon and a subtle copper hue from the cold sun. I was short of cash – I live too much off plastic – and was worried that I would be turned away by the ticket person at the Priory. Thankfully, the little gray hut was locked and so I drove on. Parked opposite the lighthouse I sat and stopped my mind. As well as my camera I’d forgotten my coat and it was definitely not a day for shirtsleeves. So I got out the small binoculars and focused on the lighthouse bell. 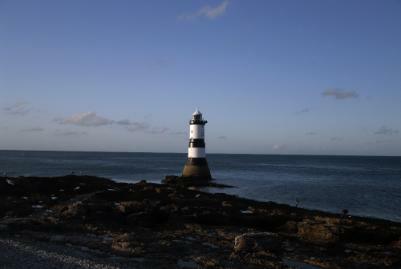 The Penmon lighthouse bell does not ring out. It is melancholic, despondent and haunting in its lonely-making sound reaching out further to sea and resonating longer. 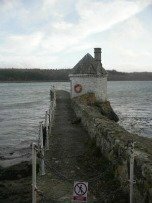 When the tide is out - unlike today – it’s possible to walk right out to the lighthouse and contemplate the steep steps up to the locked and barred doorway. Through my little bins I was reminded that it takes a bit of nerve to climb up to the door to negotiate the lock. The steps are alternate, right and left and rather forbidding. I’ve been about halfway up and backed down because the paucity of secure purchase is unnerving. So I won’t be trying that again. Across the Sound Puffin Island is like a rusty half submerged boiled potato with seagulls rising and descending as their day’s activities come to an end. Too late to do any fishing or scavenging so it’s back down to the nest to contemplate the successes of the day and reflect on lessons learned. At the very limit of artificial binocular vision I could scan the little stretch of pebble beach opposite the concrete red buoy. As the light fades through the coppery to the darker blue the shadows began to move. 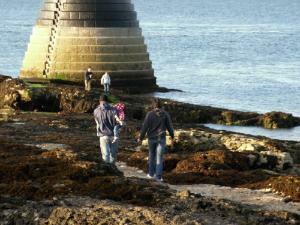 Was it my imagination morphing the rocks in the distance or was there movement? Was that a head bobbing up and down slowly on the beach or not? It was a SEAL. An honest to goodness seal. In fact there were, I think, three or four of them - the odd head bobbing up and down. A singular large shadow separated itself from the amorphous mass. These buggers are big. It slid into the sea to bob up and down gazing about in expectation of something or other. 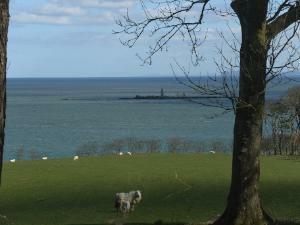 The best place to see Gray Seals close up from the shoreline is in the Llys Dulas area. These silky swimmers are very inquisitive creatures and will pop up to watch you, dive and then pop up a few hundred yards to your right or left. Sit, be peaceful and appreciative and they will swim close enough for a good photograph or allow you to see them twitch their whiskers. Anyway, the light faded into near twilight and it’s time to switch on the engine to get the heater going and head off home. 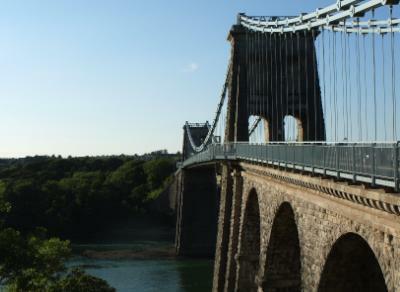 On the way I turned up the first left road in Menai Bridge to drive slowly below Thomas Telford’s masterpiece suspension bridge. 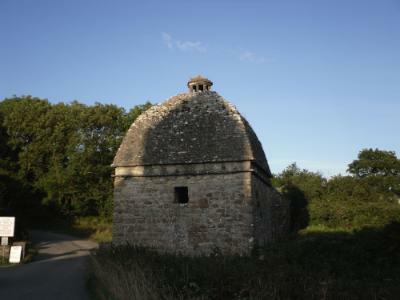 Once again I take a moment to contemplate and revere the work of stone masons of the early 1820s. A solitary fisherman paced about to keep warm while watching his tripod and rod for a sign of supper. Then home to partake in Plan B and buy a Lotto ticket. Hope for tomorrow or is it Free Beer Tomorrow.